Vitiligo is a long-term skin condition characterised by patches of the skin losing their pigment. The patches of skin affected become white and usually have sharp margins and are more noticeable in people with dark skin. Normally, the colour of hair and skin is determined by melanin. 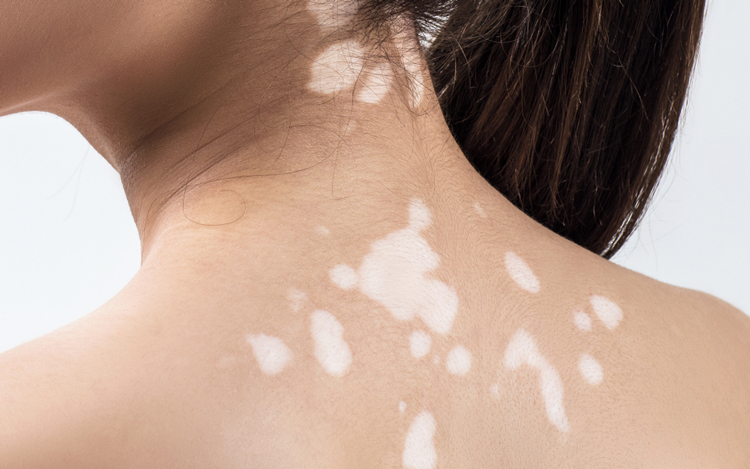 Vitiligo occurs when the cells that produce melanin die or stop functioning. The condition is not life-threatening or contagious. A disorder in which your immune system attacks and destroys the melanocytes in the skin. A trigger event, such as sunburn, stress, or exposure to industrial chemicals. It may be the result of psychological stress and those affected may be stigmatised. What can I do to treat Vitiligo? There is no known cure for Vitiligo. For those with a fair skin, sunscreen and makeup are all that is typically recommended. Other treatment options may include steroid creams or phototherapy to darken the light patches. Alternatively, efforts to lighten the unaffected skin, such as with hydroquinone, may be tried. A number of surgical options are available for those who do not improve with other measures.